The FG series is an ESD Hot Glove designed to provide static control and significant heat protection in one cleanroom compatible glove. These FG series Nomex® gloves are perfect for applications involving printed circuit boards, hybrid circuits, semi-conductors or most other processes that require handling objects at elevated temperatures without compromising cleanliness and/or potential damage due to static discharge. Available in 11" and 16" lengths (measured from the tip of the middle finger to the cuff). These gloves use monofilament Nomex® woven fabric suffused with carbon fiber. To enhance the heat protection a 100% inner insulating tricot knit polyester fabric liner is used. 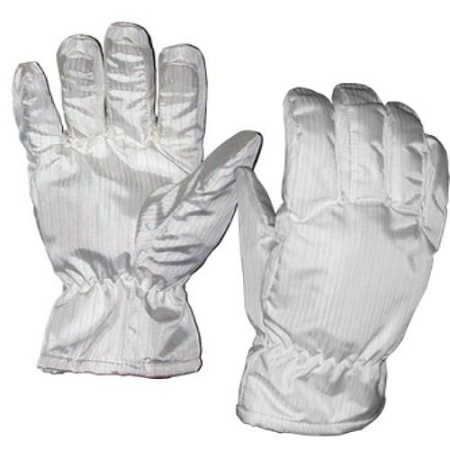 The face fabric of these gloves are 99% Nomex® and 1% Conductive Carbon Yarn. The gloves are tested to resist heat up to 570° F/300° C according to ASTM F 1050 modified. The melting temperature of the Nomex® fabric is 840° F/450° C. Nomex® is a registered trademark of DuPont. The FG2601 is a small sized 11" long ESD Hot Glove. Length is measured from the tip of the middle finger to the cuff.